Aurora template will be the 1st responsive template for Elxis CMS. 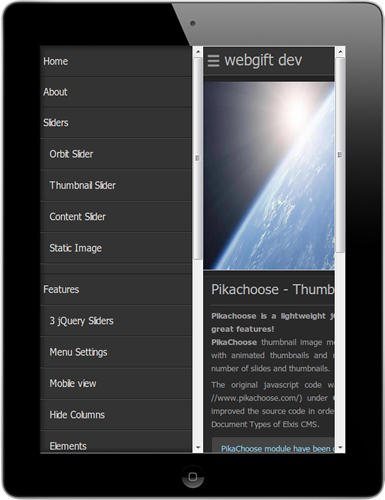 It will be compatible with Elxis CMS 4.x users. Although if you want something to be mentioned - implemented you could send your feedback about or any comment here. Please note that the screen shots below are sample. Template is under development. I will add more information soon! Note: Vertical scroll bars are generated through emulators and it's NOT part of the template. Re: Aurora - 1st responsive template! 1. 2 basic layouts: Boxed and Wide one. 2. 2 base themes: Light and Dark view. 5. 6 font families are included! 6. At the homepage there are up to 12 module positions. 7. Either the layout is selected as Boxed or Wide there are 4 different (hide) maximum width of total container. These are: 940, 960, 980 and 1020 (in pixels). 8. 4 modules (Image sliders) are included to the Aurora package. These are fully responsive. 9. 2 different technologies are implemented according to menus. Vertical and the horizontal ones. 10. 3 basic columns (left, main content and the right one) with the option of hide up to 2. - Tested with all of the modern web browsers. - Compatible with all of the available document types of Elxis CMS 4.x. Recommended the HTML5 document type. Aurora is the most flexible and complete template we have ever created. Its modern and fully responsive design best fits into current web trends. Included colors, themes and layout makes it ready to work in just a few minutes. We put a lot of effort to make the template intuitive to use and easy to customize. You won't find any better tool to build exceptional sites (blog, business, portfolio, products, online reservations etc)! We are proud of this template and we hope you will also be. - Small appearance improvements are made concerning the color of links and likable headers. - Added the option of changing the position of pathway from template's parameters. 3. Bugs fixed for Aurora template. As a thought of the upcoming version of Aurora package will be a new fully responsive image slider module. If you have any ideas about please don't hesitate to share with. I have just bought the template.. Its amazing..
How can i change the width of columns?? Hello, changing the width of columns may add to version 2.0 of Aurora template. @ahmet, thank you for your kind comments. Aurora template give you the option of hiding the side columns (left and right one) up to 6 different pages. You can write down a URL segment of the page you are interested with at the template's parameters. I don't find this parameter...it is only possible changing from 2, 3 columns. can you advice .. Thank you @bledi for the report. Version 2.0 of Aurora template will be released soon so all of the reported bugs have already fixed. Aurora template updated to versions 2.0 rev291. Soon more details about how to update!